© Estate of Doris Lee. Photograph by R. H. Hensleigh and Tim Thayer. Doris Lee was a popular American artist from the 1930s to the 1950s. Although she is sometimes considered a folk artist because of her seemingly naive style, Lee studied painting at the Kansas City Art Institute, in Paris with various artists—including Cubist André Lhote—and at the California School of Fine Arts. Early in her career, her paintings were Regionalist in style and subject but in the 1940s her style shifted to flattened, simplified forms. Fisherman’s Wife appears deceptively simple at first glance, but closer scrutiny reveals a refined use of shape and pattern with bright, harmonious colors. The smiling wife on her porch welcomes the viewer, as well as her husband, into the painting with its lush garden and whimsical animals. Lee painted Fisherman’s Wife in Michigan, probably while a visiting artist at Michigan State College (now University). 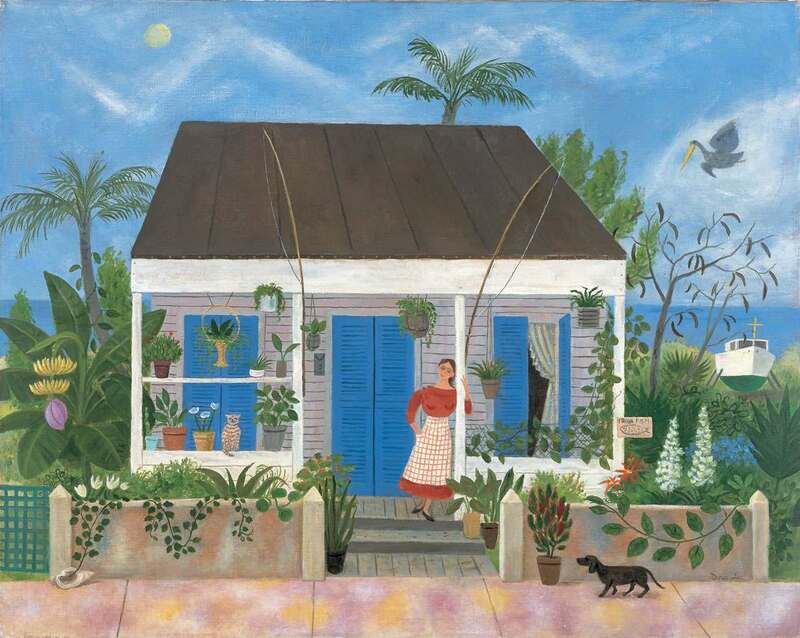 It reflects her memories of Key West, Florida, where she had a winter studio.